If your kids are in need of some cool Santa sacks to haul their booty home, come and see these stunners. Santa sacks are so much more versatile than much of the Christmas paraphernalia. They make gorgeous wrapping for gifts, and they are also useful for taking home a mountain of gifts from grandmas! And the best thing is they can be reused year after year. 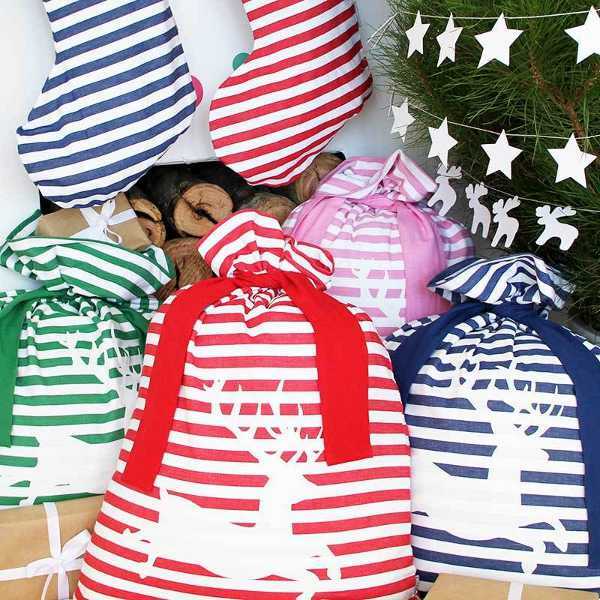 These new Santa reindeer sacks from Urban Baby are very modern, with their stripes and bold colours, and reindeer design. They are seventy-five centimetres high, so perfect for children to be able to comfortably carry, and they gather and wrap at the top to stop prying eyes. The sacks are screen printed and fully lined. They’re available from Urban Baby for $44.95 each.